Hot and slow, warm and low, smoked or open air - so many factors go into making the perfect BBQ but once you think about it, the perfection is subjective. There are variations of barbecue depending on region though you may only be familiar with the ubiquitous Texan-style. 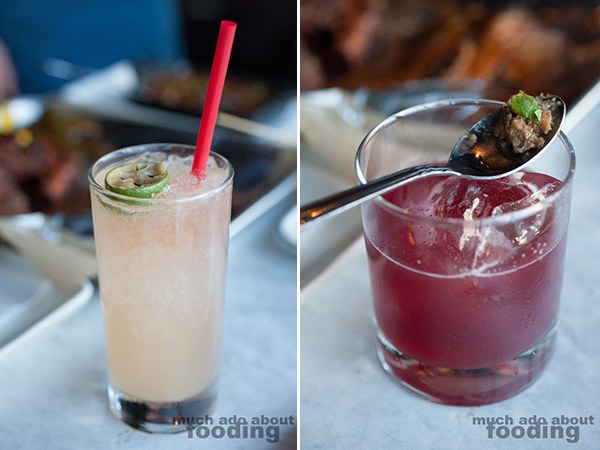 When we learned that Silverlake (Los Angeles) recently became the home of Charcoal BBQ Bourbon and Beer in February, a barbecue spot that is based on Kansas City style, we were curious. What exactly does that mean? A talk with Chef Jeremy Zimmerman cleared the air about the technique, and a tasting by invitation placed that flavor profile onto the palate. Whereas Texas-style is direct heat through a pit with screen door resulting in the hottest section being the middle and the involvement of a spicy tomato-based sauce, Kansas City style involves an enclosed smoker with indirect flames and a dry rub start (and tomato-molasses sauce end!). The BBQ is different but still great in its own way, and during our visit, we got to explore what that panned out to be like as well as what other wonderful dishes Charcoal had to offer. The restaurant is part of several by the same owner and is connected to Barbarella; originally, it was an Italian restaurant that just did not catch on with the community. However, upon opening as a BBQ-focused spot, Charcoal has been received very well and the food is a large part of that success. Before we get into that portion of the program though, let's talk about their beverages - beer and bourbon are the stars here. Their extensive 60+ bourbon (with whiskey, the collection grows to ~90) list features small batch labels that include the likes of Angel's Envy and Eagle Rare. Fifteen different states are represented in the selection, and the focus on this niche of American small batch is very deliberate. Because of the American barbecue menu, it only made sense to feature American spirits. Beers flow from 25 taps that are constantly rotating to expose their clientele to the beauties of American craft beers. Bourbon and beer not your thing? Don't worry - wine is also poured at Charcoal as well as cocktails. The innovation showed through the two we tried out - the Backdraft ($12 - rum, lime juice, and ginger syrup topped with ginger beer and a bourbon flame) and Figgin' Nuts ($12 - walnut-infused bourbon, fig syrup, fresh blackberries, and mint leaves). Though you can hardly see it, there is a flame in the key lime slice floating in the Backdraft; it rages on to release a burnt, zesty bourbon scent. Both drinks were well balanced and let every component shine. The Figgin' Nuts had a few errant pieces of what I assume was walnut shell but other than that, it was an easy drinker and the dark, jammy fruits played well with the bourbon. 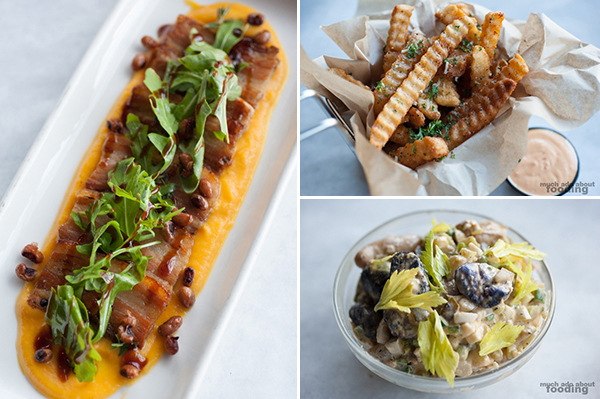 Charcoal's menu reads with some good ol' fashioned barbecue-related dishes and accompaniments but with a more modern twist. For example, the restaurant offers Burnt End Quesadillas, which play on the indigenous Kansas City dish of burnt ends (cubed trimmings from brisket). They are smoky and strongly flavored so would be something a native person would order but Chef Zimmerman puts together a variation of the traditional treat by placing them into a quesadilla. Don't take his riffs on classics as unfounded though; his training with a Michelin-starred chef has given him room to play with the food everyone already knows. 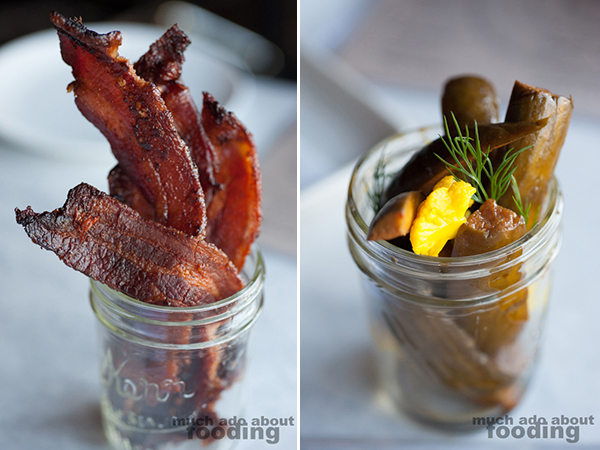 We started out with Charcoal's Handcrafted Pickles ($3) which include pickled cauliflower that are Thai-inspired. These crunchy pieces make use of tamari and sambal and were not the only instances we saw of Zimmerman's Asian influence in cooking spawned from his time with his chef mentor and that chef's Japanese wife. These inclusions made it a tad sweet and certainly easy to eat much of. The Bucket of Bacon ($5 - apple-smoked) was candied with brown sugar, chili flakes, and sea salt, all flash-fried for a crispy, sweet finish. These thick strips made for perfect, meaty "candy." The long plate of Pork Belly Confit ($10 - with sweet potato puree, crispy black-eyed peas, and fresh thyme) featured slices of pork belly confit-ed in duck fat for 18 hours before being drizzled with eel sauce. The crispy black-eyed peas added a necessarily crunchy texture to the whole appetizer as well, and the flavors melded together divinely. Think sweet, salty, and savory. A side of their Basket of Crinkle Cut Fries ($6 - house dipping sauce) came with chile aioli and were pleasantly nostalgic but done well and with enough of a balance between crisp on the outside, fluffy potato on the inside. Then the Young Heirloom Potato Salad ($5 - organic eggs, pickles, and celery seed dressing) impressed afterward, a dish that is always made fresh to order because Chef Zimmerman dislikes soggy, over-dressed potato salad. This evolved from his own mother's recipe, adding a personal touch to the menu beyond the chef's own creativity. We liked the pickles dispersed between the potato pieces and the vegetal tastes of celery. How did you get started in Kansas City barbecue? "I started cooking at 14 and grew up in Kansas City so I would always do competitions on the side if I had time. I never thought I'd do it for a career though because I was trained in French cooking. I didn't realize how excited I got about barbecue until I started talking about doing this. It is just as difficult to do barbecue as a five-star plate. 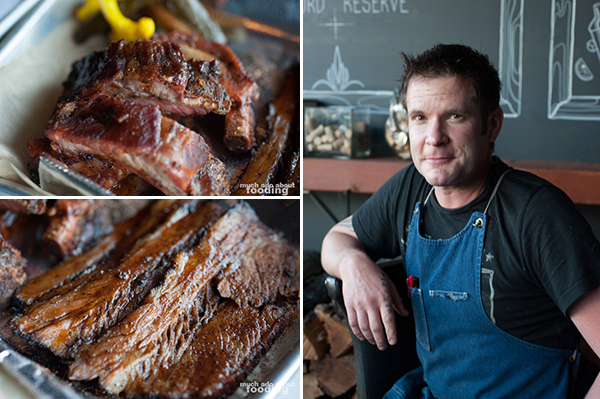 Sometimes, I'm here until 3AM making sure all of the meat is done right." 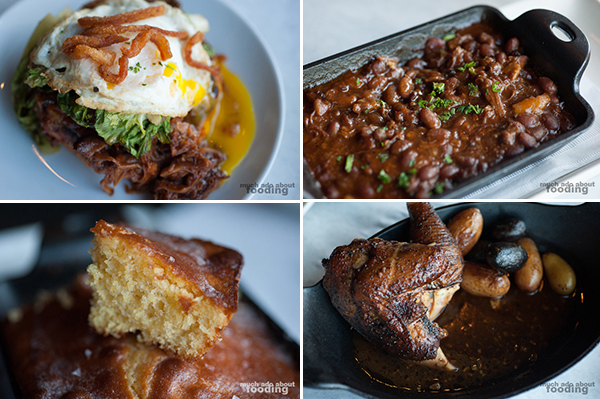 Chef Zimmerman's background in cooking and barbecue combined with his passion for perfection make sense once you see the different menu items available. They may seem sparse in number but are robust in flavor and varying in techniques. We started the entrees off with the Charcoal Banh Mi ($12 - smoked pork loin, pickled vegetables and herbs, pork rilettes, and smoked cola aioli) and Open Face Pulled Pork ($15 - organic greens, fried egg, and crispy chicharones), a tribute to Carolina style barbecue. My first impression of the banh mi immediately was a memory of the street night market banh mi in Vietnam which have a smoky, wholesome taste to them. The choice of smoked pork tenderloin was excellent and because it was done well, very tender and lent itself to an authentic taste. In fact, when I mentioned this to the chef, he said he learned how to perfect this sandwich from a Vietnamese grandmother! 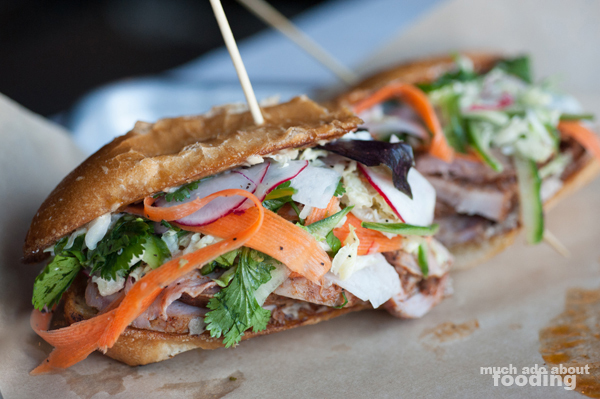 He did, however, use Mexican borillo for the bread since it was the closest to the street-style banh mi around. We loved it. The open faced sandwich was very wet, and thus very much like a Carolina pulled pork sandwich. However, I don't prefer soggy lettuce and this one had it even before the runny egg was cracked. The pork was great with the crispy chicharones however. The next entree out was BBQ Chicken ($13 - half, $20 whole; with roasted heirloom potatoes) straight from the smoker along with sides of Baked Pork-N-Beans ($6) and Cast-Iron Corn Bread ($3), very barbecue of them! 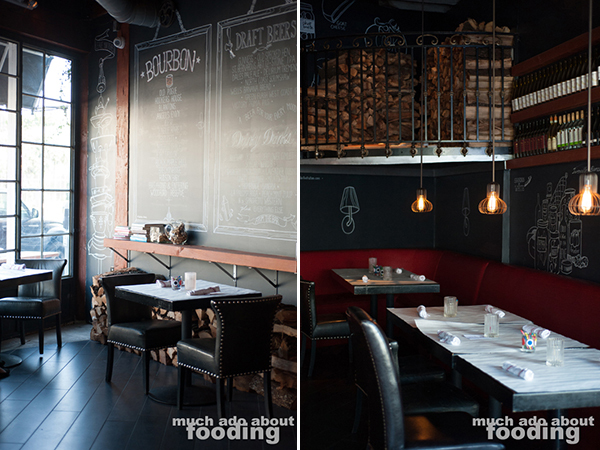 The logs of wood in the restaurant along the walls and in alcoves near the ceiling are used for the same smoker that puts out the chicken and other meats, an apt touch for the restaurant, and hickory mesquite chips soaked in bourbon cider give more personality and flair to the overall flavor. Therefore, the chicken was very smoky with a crisp, roasted skin; unfortunately, it did strike us a little dry in some areas. For the sides, the pork-n-beans contained both bacon and pulled pork, a trait associated with Kansas City barbecue, and therefore were quite enhanced by these meaty additions. The star of this trio selection, however, was the cornbread made from a family recipe. The chef claimed them to be simple but the magic in each piece's fluffiness, butteriness, and richness told us it was better than simple. This is a must when you visit Charcoal. 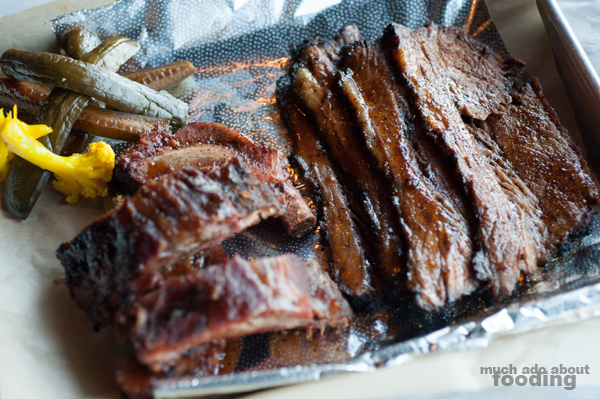 The last out was a showcase of all the pieces that make Charcoal great - the Mixed Plate ($22 - ribs, brisket, and sausage). The brisket is marinated for six hours before being moved to the smoker and cooked overnight at a low and slow pace. The ribs got smoker treatment as well and were very tender. We both preferred just how succulent the brisket was as well as its amazing smokiness. Juicy and with the perfect texture, the slices of brisket are a true treat. Chef explained how the meats are prepared competition style meaning they are individually wrapped in foil; these come from his past involvement in barbecue events and in a way, individualized the portions to contain as much care in preparation as the next batch. You can't end a Midwest-style meal without an appropriate dessert. 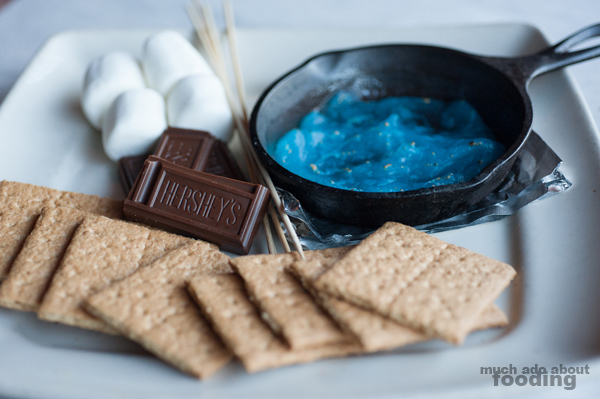 Take their S'mores for Two ($9) with a real skillet fire as a nostalgic indulgence if you want the experience. If that's not your thing because these are just simple Hershey's, graham crackers, and marshmallows, you do have other options as well. 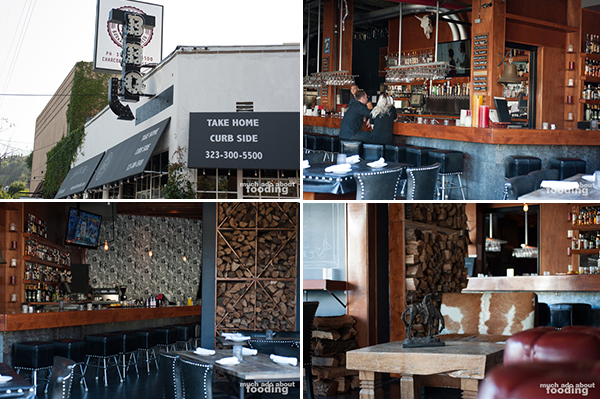 As a whole, Charcoal, located at 2611 N. Hyperion Ave, Los Angeles, CA 90027, is unsurprisingly well-received and well-visited already in its short few months' stint. Not only can you dine in and get a full, delicious experience but you can also participate in curbside pickup. 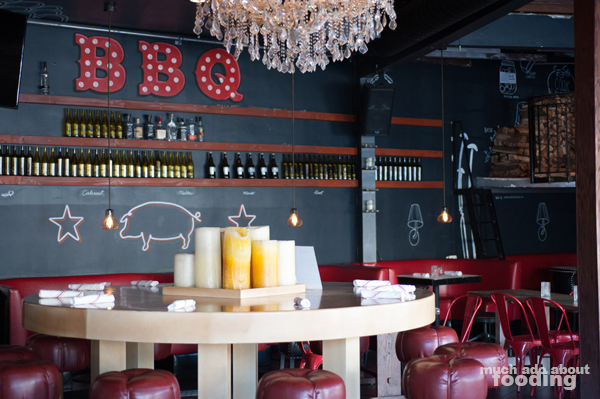 Hankering for some Kansas City barbecue done well? You'll do yourself right by going to Charcoal, and we say get the brisket, cornbread, and a batch of their delicious pickles.